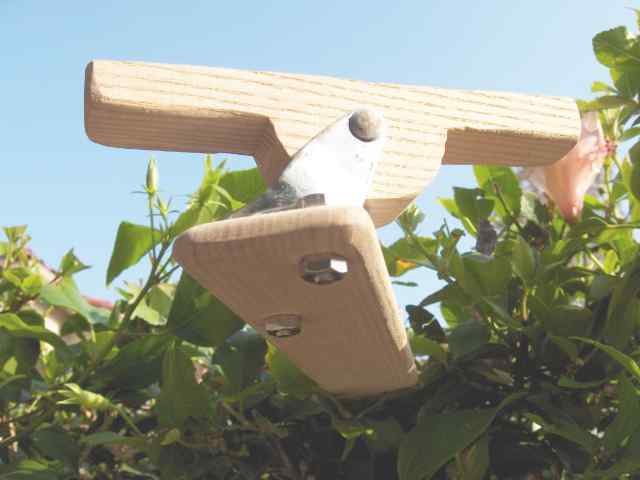 This Adaptive Paddling Fixture incorporates a straight Ash wood boom. One end of the boom is firmly attached to the front deck at the appropriate angle. The boom supports quite a bit of weight, allowing the paddler to rest the entire weight of his arms on the paddle and lean or pull against the paddle. The flexible boom is adjustable in length and allows the paddle to be dipped and raised as needed for paddling. 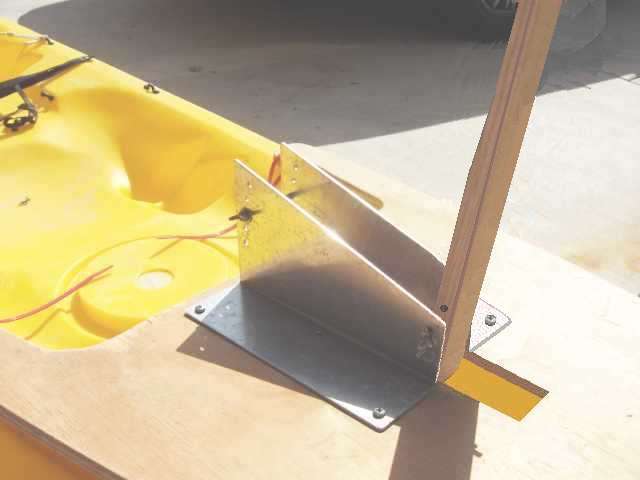 The main features of this design are that it holds the paddle up for the disabled kayaker and it always keeps the paddle blades oriented in the vertical position. The following picture my latest design for the 'paddle-lock'. This design incorporating the swivel-caster is my latest development and has a much smoother action than the original plate version. This will be the basis for all my future 'paddle-lock' designs. This is my latest designs for the "paddle lock". It uses a 2.5 inch wheel, swivel-caster. This caster model has a threaded axel which makes it easy to remove. The paddle-block was cut on a precision band-saw. I even cut the channelway for the paddle-shaft on a bandsaw by opening the guide way up and standing the block on its end. The block should fit pretty snug in the caster and the axle should be an exact fit into the wood. Width outside at rear holes:       27.0"
Length from strap center to edge:  23.0"
strap center to front edge:        2.25"
Notches to fit strap snugly:       2"
on the Deck Plate to further accommodate the rider. of the Deck Plate to the Factory Installed Eyelets. Note: This photo shows the earlier version that uses a Hinge Plate. Swing the Paddle Boom up for easy access. Do Remember to Hold onto it! 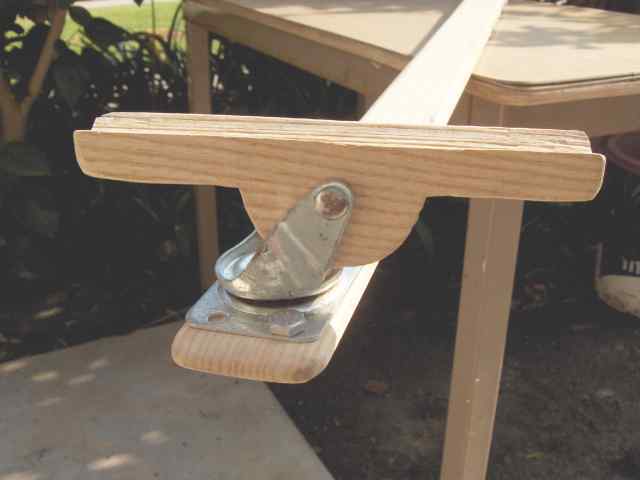 wood Hinge Plate and the two bolts that secure the Boom to it (shown above). secured by tightening the Rear Wingnut. Tighten the others again while you're there! In the original design, the boom has eight 3/8" holes drilled in it on 2" centers to allow for a range of adjustments on the hanger-bolts which are installed into the boom wedge on 6" centers. On the Scrambler XT, Two 3/8" holes are drilled into the hatch cover on 6" centers with one hole being placed in the exact center of the hatch. 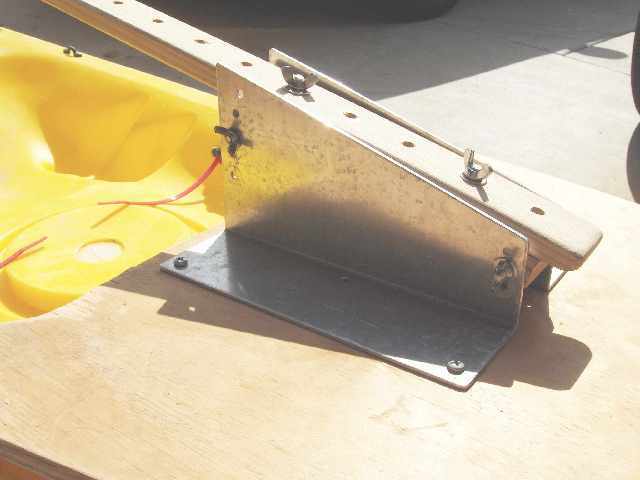 An additional six inches of adjustment range are provided for the boom by simply turning the hatch cover around. The Business End! Tape the Paddle Shaft Securely with Duct Tape. Center the Paddle on the Boom, Not the Paddle-Lock. 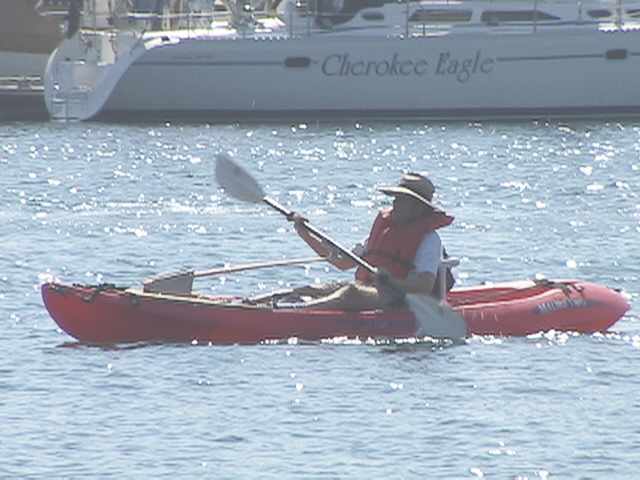 Paddle is in the Mid-Stroke Position (90 degrees). 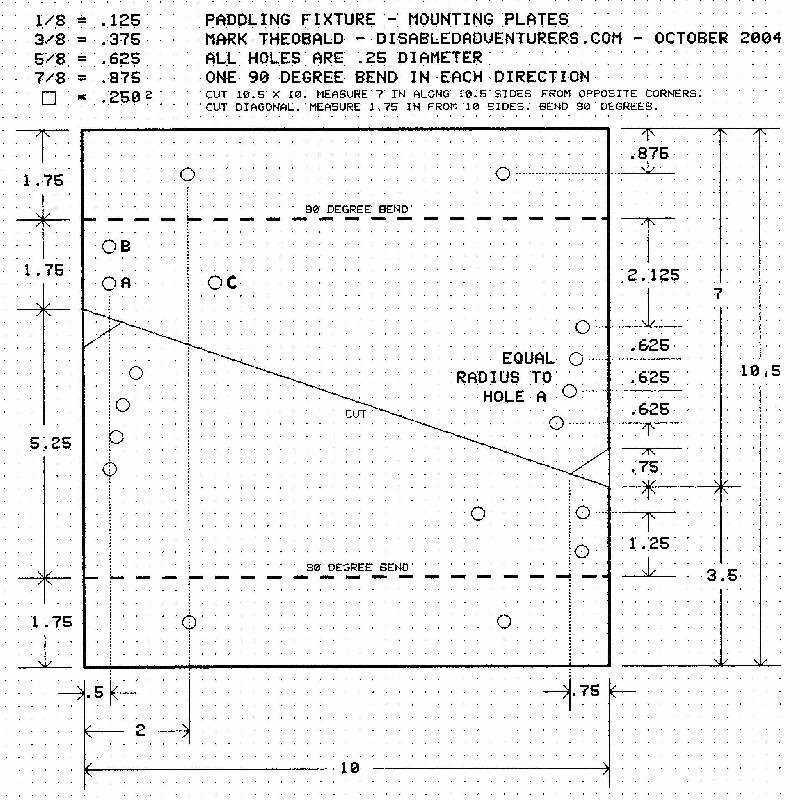 This drawing gives details for making the aluminum Mounting Plates as shown above. See below for the latest Universal design! 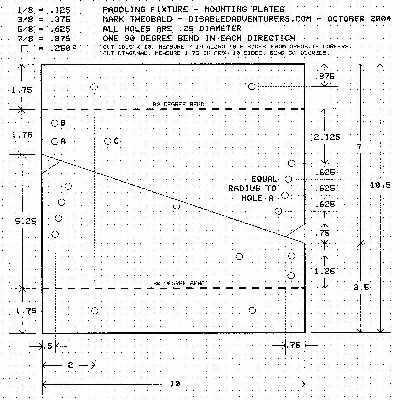 Start with a 10" X 10.5" plate of 0.090" Aluminum. On each 10.5 inch edge, measure in 7" in opposite direction for each side. Mark and cut the diagonal line between those two points. Mark and drill all holes, as shown, prior to bending. Measure 1.75 inches in from the uncut edge, mark and bend 90 degrees. Be sure to bend one in the opposite direction of the other! the Deck Plate, adjusting their position lengthwise to suit the paddler. 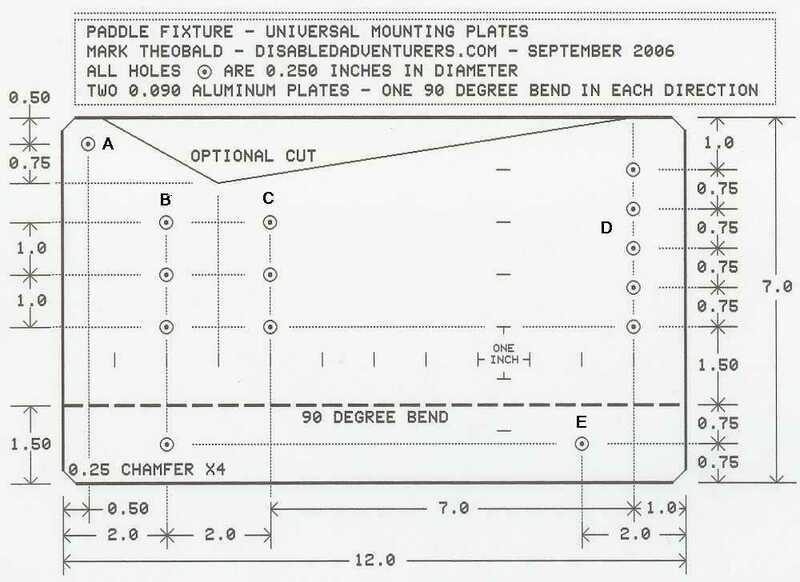 Here's my very latest (as of march 23, 2007) design for the aluminum mounting plates. Hinge-Plate. Each plate is made from a 12" by 7" plate of 0.90 aluminum. in place. The holes at E are for mounting to the Deck Plate. Click on the photos above for the Full-Size (and clearer) versions. The boom is 48" long and 2" wide. The paddle end is 3/8" thick. through at 2" spacing to allow for further length adjustment. Plate and two expensive stainless-steel mounting bolts! more adjustment still, as illustrated with Holes B and C in that drawing. Holes at B and C illustrate the addtional positions in the new design . that hold the Boom to it). 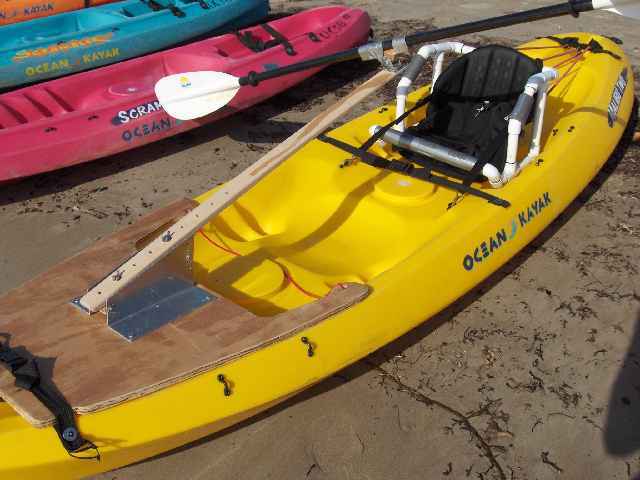 The last photo in the group of shots above shows the second prototype of my paddling fixture adapted to a Malibu Two which was given to me by Ocean Kayak, Inc. for the purpose of developing and adapting these fixtures. The Malibu Two is simply a fantastic kayak for this purpose, particularly because it has all the stability even the heaviest paddler could ever desire. The superb handling, tracking, and decent speed of the Malibu Two just about guarantees a fun and dry ride for every paddler. 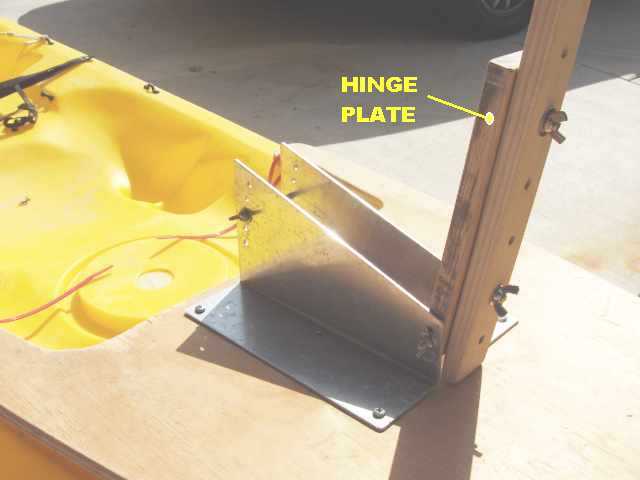 The method of attachment I used on this Malibu Two can be used on ANY kayak. My latest design greatly improves on this concept! 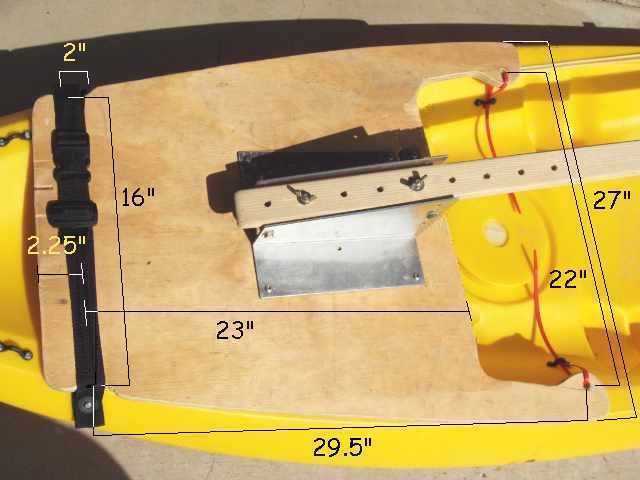 Eventually, I'll use the latest method to attach the fixture to a Frenzy which will round out the size categories for kayaks on which we have tried the fixture. For paddlers desiring a whole lot more stability still, I'll probably give it a try on the Drifter too.